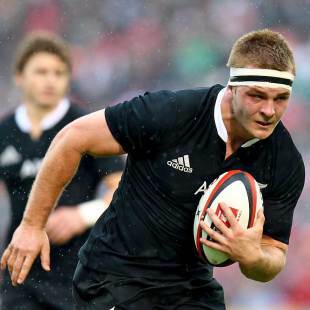 Sam Cane is about to get a serious workout against South Africa with less than 60 minutes of Test rugby under his belt this year, the Chiefs openside set to start in the Rugby Championship Test in Wellington on Saturday after a quadriceps injury ruled Liam Messam out of action. Cane missed the three-Test series against England with a knee injury and made only late cameo appearances in the two Bledisloe Cup matches against Australia before the extended hit-out in Napier. He got a valuable 37 minutes of action after Messam limped off the field, with captain Richie McCaw moving onto the blindside. With Jerome Kaino still recovering from an elbow injury, McCaw is likely to play at No.6 in Wellington, giving Cane his 10th Test start. But coach Steve Hansen is not revealing his hand just yet, saying ""there's no point us telling South Africa what we're going to do - we've got options". Cane, part of the All Blacks' leadership group despite not being a regular starter, is keen to see more action. "I'll just take any minutes I can get," he said. "The more game time the better." The All Blacks will also be forced into a change at lock in the starting XV to face the Springboks, smarting from a late 24-23 defeat by Australia, after Sam Whitelock injured his ribs in Napier. Whitelock and Messam, will each miss at least three weeks, meaning their participation in the Rugby Championship is likely over. Wellington's Jeremy Thrush, who had a strong game off the bench, is likely to make his first Test start in Whitelock's absence, while Hansen said the selectors were yet to decide who to draft in as extra cover for the injured pair.